I came to this profession by a circuitous route. After the customary amount of academic experience, I found myself in the equally stressful and compensated aeries of banking and finance. But a vacation in California became a life change, as one box closed and another opened. I found a new job as an apprentice woodcrafter in the fall of 1982. That was at first the means to get through the winter in the mountains around Donner Pass. Years elapsed in that job beyond that first winter, until circumstances eventually led me to San Francisco ten years later. Lacking a better idea, I opened my own studio, and commenced to run through successive periods of kids furniture, lawn furniture, faux finish cases and café tables. All the while, I remembered my apprenticeship learning marquetry and inlay techniques on small- scale objects. .in this modern age, the warmth of polished wood offers relief from the digital, the virtual, and the fleeting. 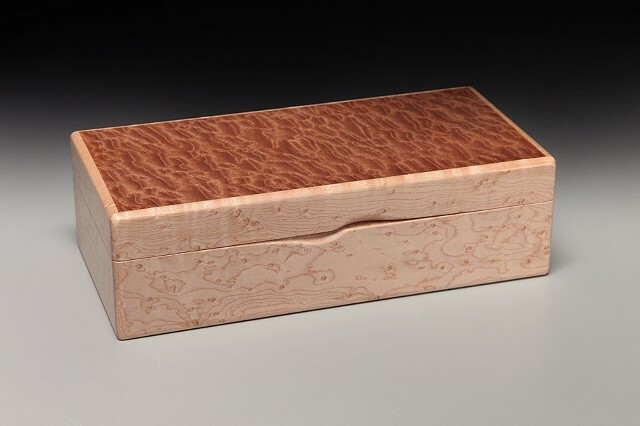 I use simple designs with dramatic materials to make this box a secret place for your treasures  real and virtual.